Container adoption has been skyrocketing, but as enterprises mature their container implementations, they face challenges in large-scale orchestration, time-to-market, and security. Amazon’s Managed Kubernetes Service (EKS) and AWS Fargate, which runs containers without having to manage servers or clusters, offer organizations great flexibility, scale and hassle-free options for deploying container-based applications. The different modes of deployment also make it necessary to gain visibility and uniform security controls across EKS clusters and Fargate deployments. Protecting the application layer requires in-depth understanding of the workloads and their intended functionality. 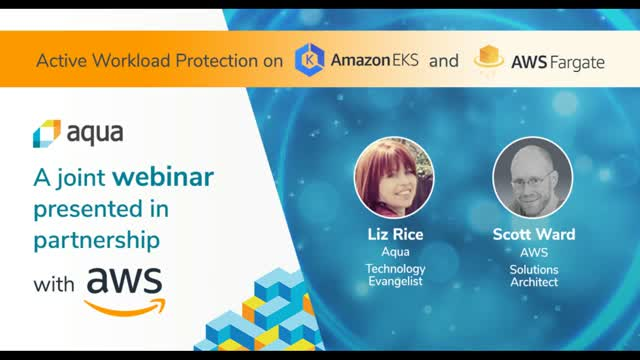 Join our speakers Scott Ward, Principal Solution Architect, AWS and Liz Rice, Technology Evangelist, Aqua to learn how to secure your AWS container deployments.